Bartow County is a vibrant, business-friendly community with excellent educational opportunities and unmatched quality of life. In addition to being an up and coming sports and entertainment mecca, our state of the art Smithsonian affiliated museums, library facilities, top-flight resorts and recreational areas, and welcoming people make this "one of the most likeable places to live among the metro counties" according to a poll conducted by the Atlanta Journal-Constitution. Nestled in the foothills of the Appalachian Mountains, Bartow County offers a unique blend of country charm and international sophistication. Part of the metropolitan Atlanta area, Bartow County is just 30 miles northwest of Greater Atlanta, along the I-75 corridor. 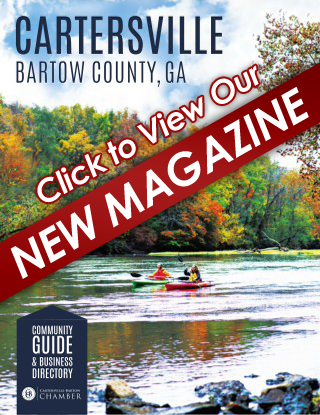 Check out the 2019 Community Guide & Business Directory for information on the wonderful attractions and amazing treasures in the Bartow County community along with the Chamber Members directory, an easy way to find a business for all of your needs.